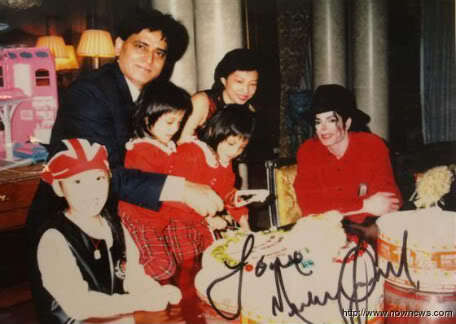 A Taiwanese fan Mrs. Ma Qi Zhen not only met Michael with her family, but also she became a close friends of Michael for many years. Mrs Ma had always kept a low profile about their 17 years family friendship with Michael Jackson. It was until Michael's sudden passing last June, did Mrs. Ma have spoken out for the first time about this in the media about her friendship with the King of Pop. She pays tribute on how kind, loving and approachable the King of Pop was. She shared her memories of an extraordinary friend and how she felt that Michael was misunderstood by many. Ma had seen the very sincere side of Michael, pure and innocent, like a big kid, love surprises, magic, very compassionate, very trusting and very caring. She hoped that by sharing her story, the world would know the true nature of Michael. The world not only loose a musical genius but a beautiful soul. Below is the video that apparently was sent by Michael to the Ma family after the History tour, featuring the Ma twins with Michael singing "Heal the World" in Kaohsiung, South Taiwan. Towards the end of the song, MJ made an effort to say "I love you" in Mandarin to the audience. This he had asked the twins to teach him before the performance. His interactions with the twins was just so sweet.